Give your feet the grace of a ballerina without all the hard work by whipping up these comfy crochet ballet slippers. Custom made to size, this pattern can be adjusted to fit teen to adult size feet using basic crochet stitches. Instructions are suitable for a crocheter with beginner to advanced experience and can be completed in a few hours. 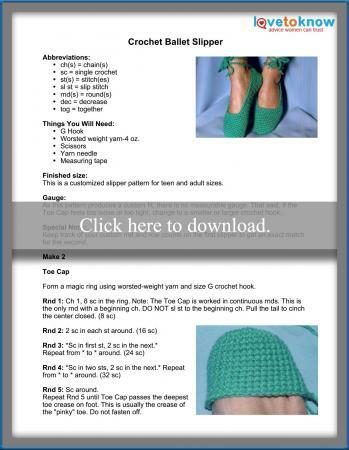 Click on the photo of the pattern to download and print the instructions. If you need additional assistance, Adobe Guide to Printables can help you troubleshoot the download. The pattern includes instructions for a teen to adult size fit and has a basic ballet slipper finish. That doesn't have to stop you from altering to smaller sizes or adding special touches to match the wearer's personality. If a child-size is desired, omit Rnd 4 of the Toe Cap, work 16 sc in Row 1 of the Sole and Sides and shorten the ties. Add personality to your slippers by sewing buttons, beads, or crocheted appliques to the top of the toes. Ribbon, cord, or fabric can be substituted for the chained ties. These slippers can easily be made as gifts even if the person who will be wearing them isn't around. Simply measure or ask the intended recipient for their foot length and the circumference measurement around the toes.